Houghton Mifflin Harcourt, 9781328604309, 288pp. For years it has been said, “you can achieve anything you set your mind to.” But have you ever wondered why so many people struggle to achieve health, wealth, and happiness? Why do we bottle-up our emotions and feel like life is happening to us, rather than for us? Finally, Dear Universe reveals the real answers to create abundance, love, freedom, and joy in all areas of your life. From the moment you open it’s pages, you’ll begin to understand your hidden, untapped power to guide your emotions and create the life you want, no matter what you’re experiencing. Feeling powerless, anxious, lonely or sad? Simply turn to one of the 100 mini-meditations to rise above fear so you can honor your feelings and move towards what you desire. Wanting to feel more abundant, lucky, confident, or inspired? Then turn to one of the 100 mini-meditations to embrace love so you can instantly transform your experience now. Filled with practical guidance, soulful exercises, and nuggets of wisdom, Dear Universe is your invitation to use the power of your emotions to achieve anything your heart desires. SARAH PROUT went from living on welfare to creating a million-dollar business. She is an award-winning entrepreneur, author, philanthropist, and founder of The Manifesting Academy. Having taught the art of metaphysics and manifesting for over a decade, Sarah now inspires millions of people around the world to tune into their infinite potential and manifest a life they love. She shares her wisdom via her Facebook fan page, Journey to Manifesting podcast, email newsletter, and website and blog. Sarah’s mission is to inspire her audiences to manifest health, wealth, and love. She believes that anyone can create the life of their wildest dreams and control their destiny, and she shows readers how to begin that journey with simple and easy steps and mini-meditations. Her work has been featured on Sunrise on 7 (TV), LA Talk Radio, Cosmopolitan magazine, Woman’s Day, The Daily Mail, and more. Sarah was born in New Zealand, raised in Australia, and now lives in Las Vegas, Nevada with her husband and four children. 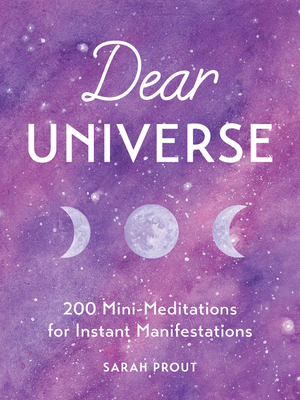 "Dear Universe is an insightful reminder of the power of emotional responsibility. Sarah Prout reminds readers hot to create courage, connection, greatness, and compassion in their lives."